My Garden Awakens. 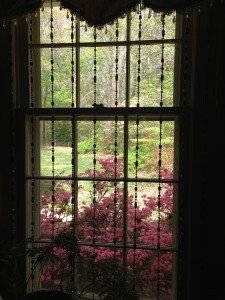 Spring had been very slow to arrive here in Virginia this year and now today is the Summer Solstice. We were all waiting patiently for the weather to remain constant instead of the temperature fluctuations all Spring. And finally, at least by the calendar, Summer is here! Hoping for some more consistent weather. We had a few 80 degree days in March which popped open many buds prematurely. Then, the night temperatures dropped down to the mid-20s on two nights in April. 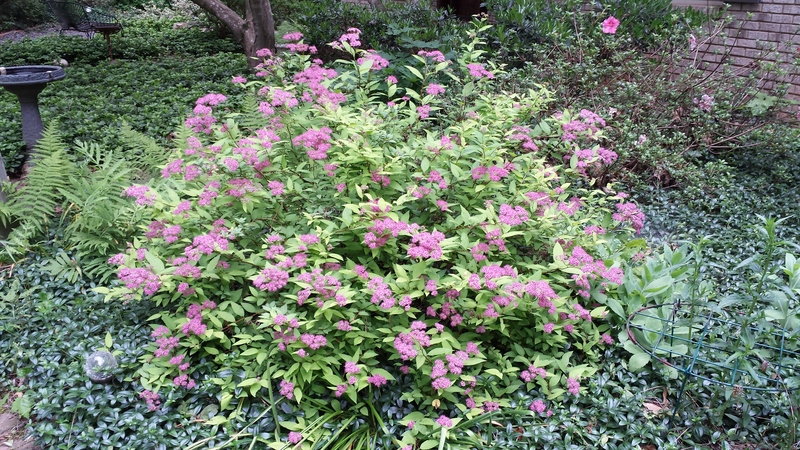 Some of my more tender perennials and bushes had freeze-burned leaves but happily recovered. Even some of the mature trees on the property lost some of their very early leaves and have sparse branches here and there. 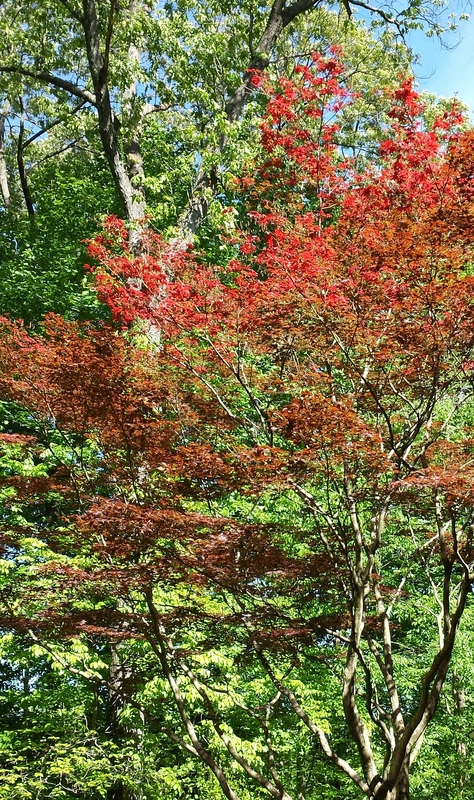 My front Bloodgood maple lost a number of early leaves yet the leaves have since resprouted. You can see the “new” growth is a bright red as compared to the deeper red on the slightly older leaves. My more “finicky” hydrangeas such as Nikko Blue had brown leaves that were freeze-burned and won’t likely bloom this year. They’re sending up leaves from the lower portion of the plants. 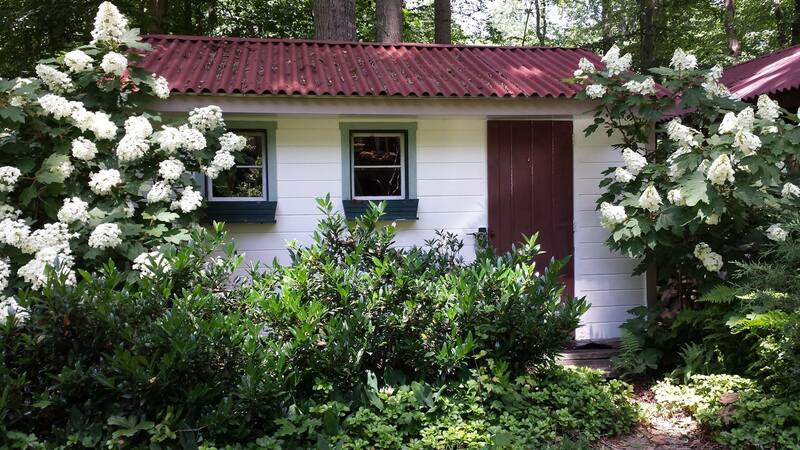 The hardy oakleaf hydrangeas are just fine though and are now in full spectacular bloom. 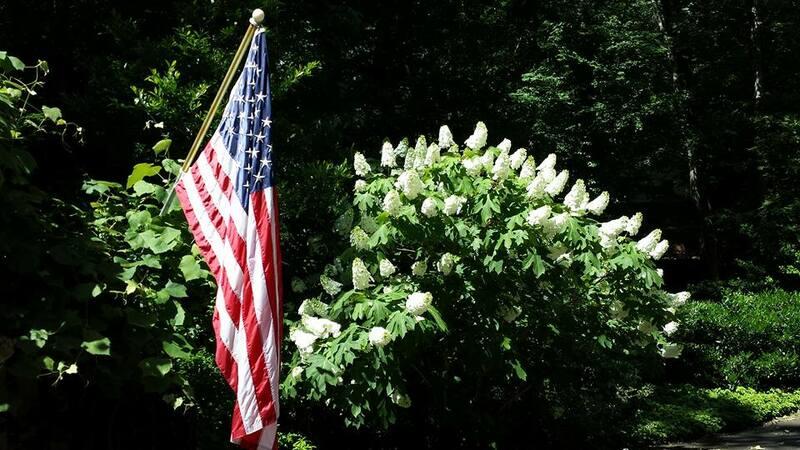 If I had to select a plant that has survived very well in my landscape — it’s the oakleaf hydrangea. Once the weather warmed up, the larger mature trees leafed out very quickly within three or four days. It’s a dense forest now and hard to see through the leaves. 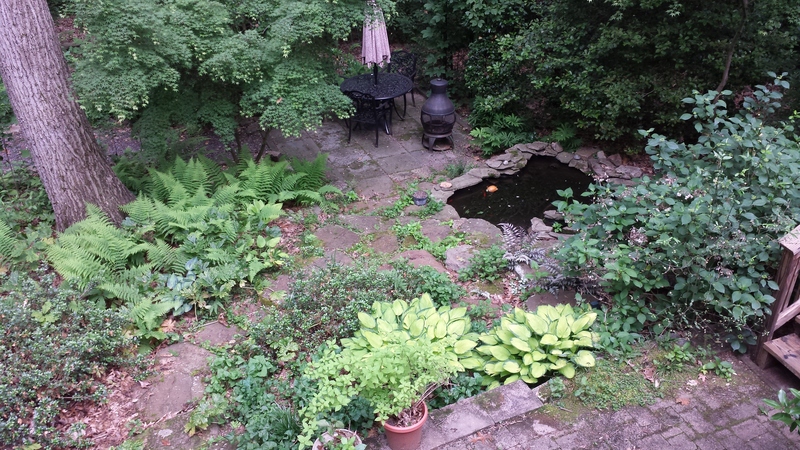 Shade can be a good thing — I love my shady backyard. 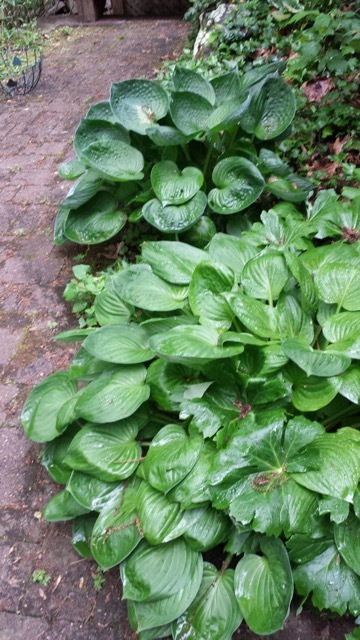 I have some hostas that are yet unidentifed that popped up a few years ago. They have huge dark green leaves. 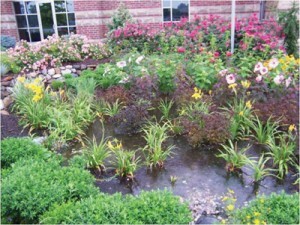 I tend to favor the variegated hostas or the solid blue-gray hostas. I’m pretty sure I didn’t purchase these very hardy performers. 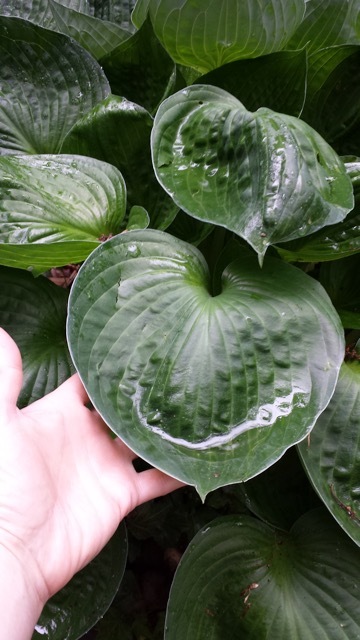 Perhaps they are a hybrid from other hosta plants. My Lady in Red hydrangea is living up to her name. She’s become very prolific in her offspring which are peppered throughout the boulders around the ponds and even growing INSIDE one of the ponds. She’s so large now, that I have to prune her back as soon as she flowers even if I sacrifice some flowers for next season. 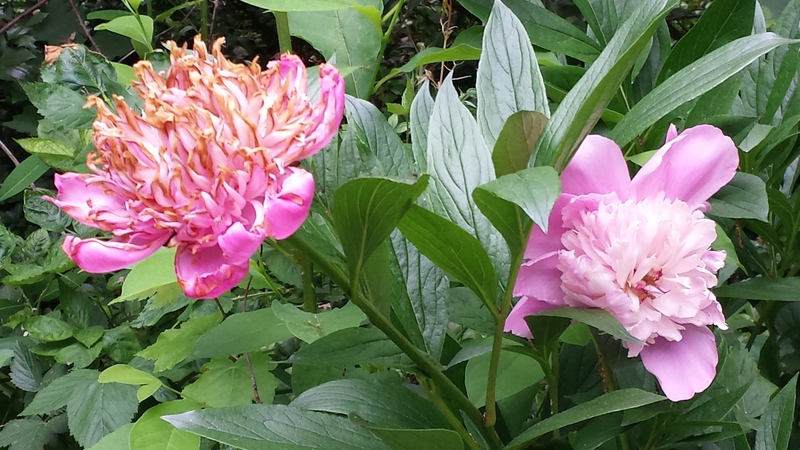 My peonies were a bit sparse this year. Last year, I had loads of blooms. This year, the blooms that I didn’t cut for my table arrangements just turned brown rather quickly. I’m hearing similar comments from others in the area. I think the late cold snap really took its toll on the unopened buds. 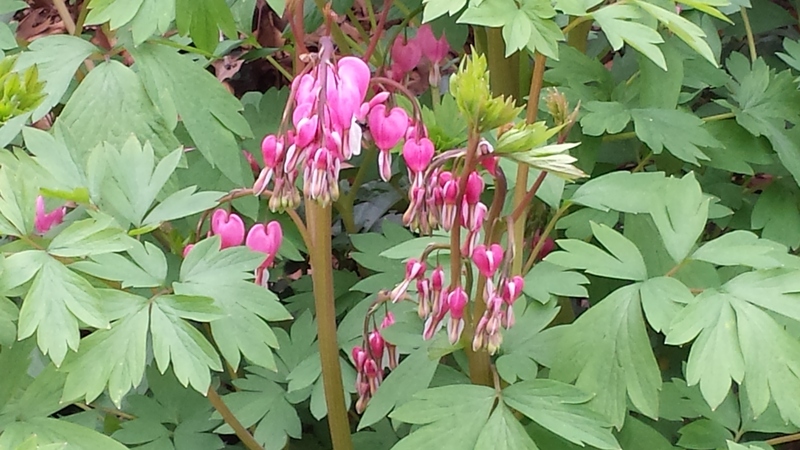 My bleeding hearts came up very quickly this year — almost a foot tall overnight! They were very prolific in their flowering which is exciting. Last year, we had a terrible onslaught of slugs’ attacking my planted herb pots due to all the rain in the Spring. This year, to help combat that slug problem, my husband surprised me with a raised bed planter that he hand-built for my birthday. I am very pleased so far with the solid construction and its utility. And, I don’t have to bend over to take care of my plants! 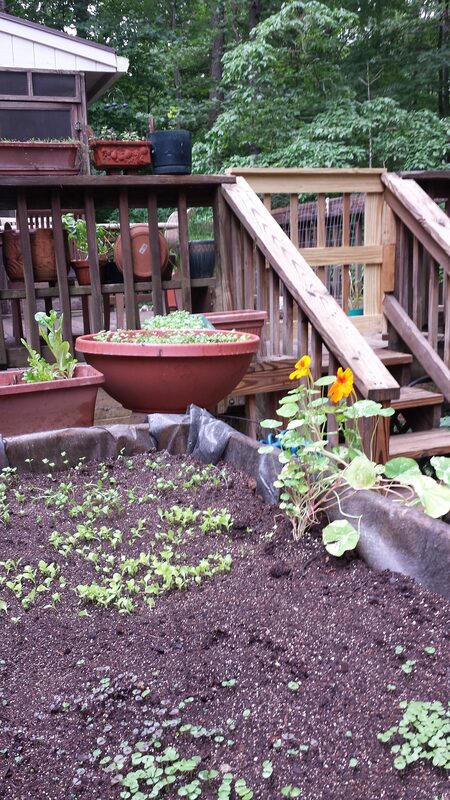 I’ve planted baby lettuces, assorted herbs, and trailing nasturtiums in my raised bed planter. More on the raised bed planter in an upcoming posting. 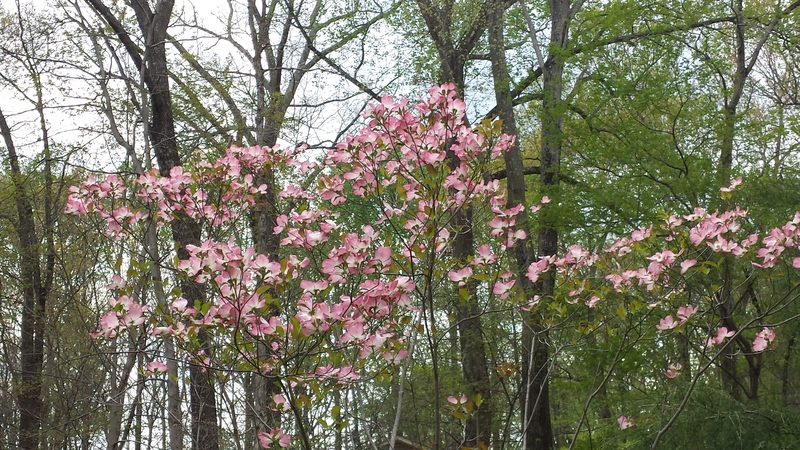 My two Cherokee Brave dogwoods were just gorgeous this year. 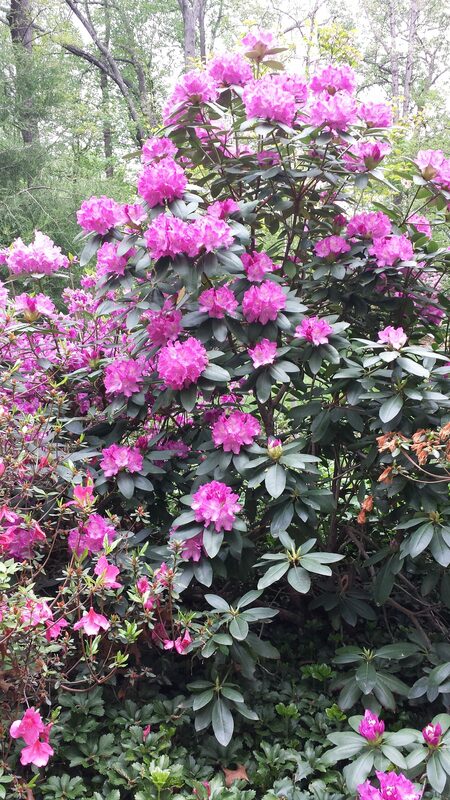 Their lovely pink color definitely signals Spring. 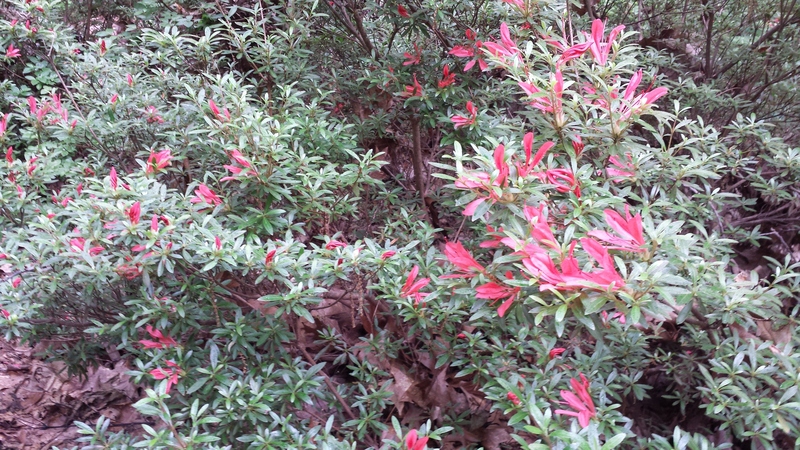 Most of my early azaleas’ buds froze on the plants. Additionally, Bambi and his friends ate quite a number of buds on my oldest pink azaleas that they rarely touch! 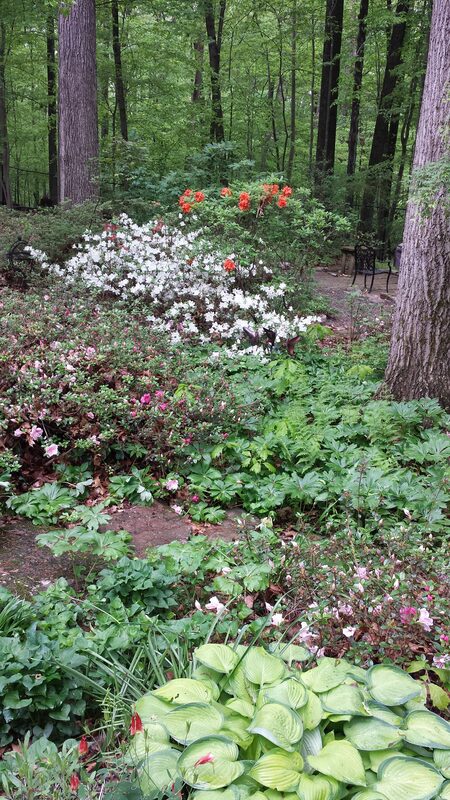 See the difference between last year’s spectacular flowers…and this year’s paltry display. 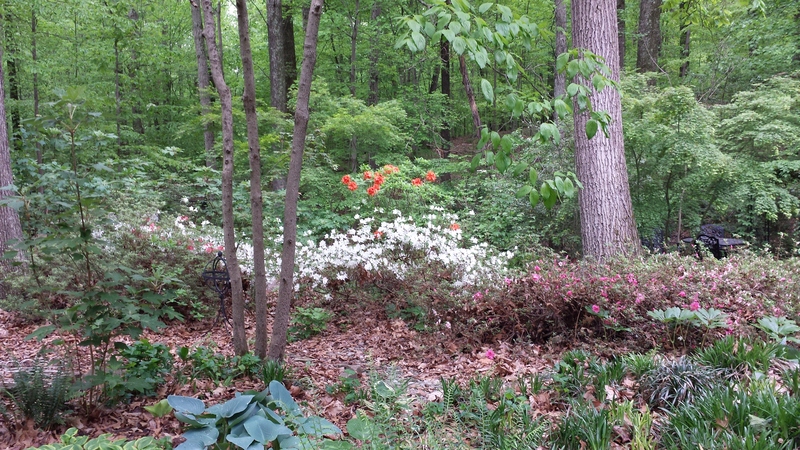 The rest of my azaleas and my rhododendrons were gorgeous this year. 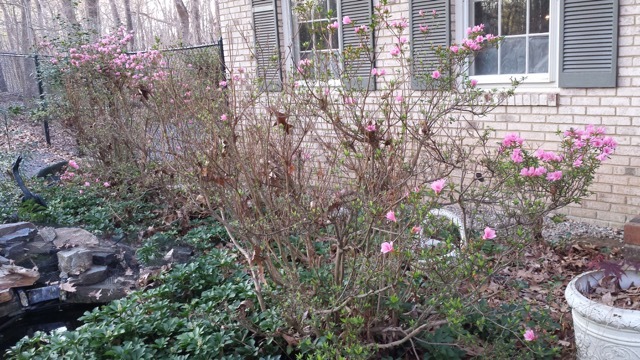 That cold snap froze the lavender-colored flower buds on my deciduous azaleas which are usually first to bloom. 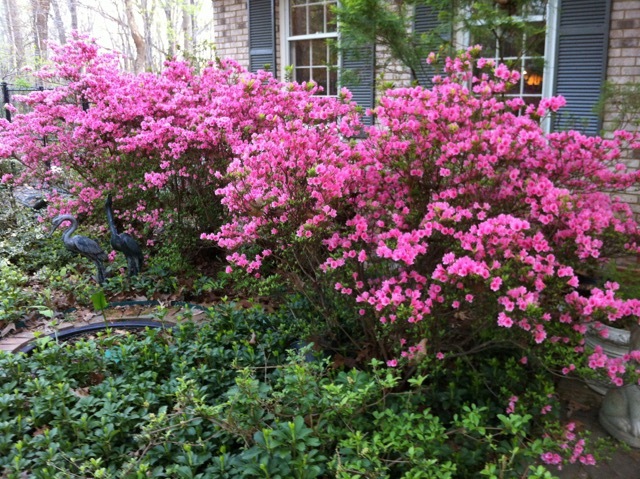 Yet even so, my red azaleas were prolific this year. The white ones really stood out, especially at night. 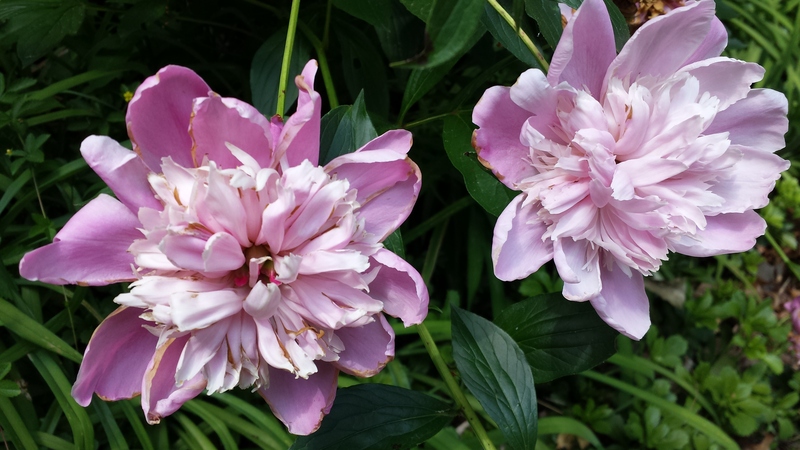 This rhododendron was stricken with borers. I treated it and look how gorgeous it became! 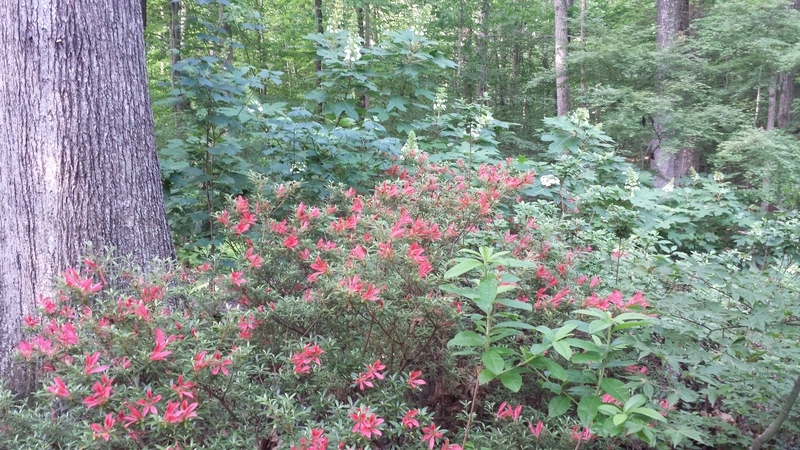 This cinnabar azalea is grown for its foliage, not for its unique flowers — I like the flowers, too! This clematis vine was so happy in its new location. Previously, its planter had been up against a brick wall. I moved it so it would get more sunlight and I was rewarded with tons of blooms! 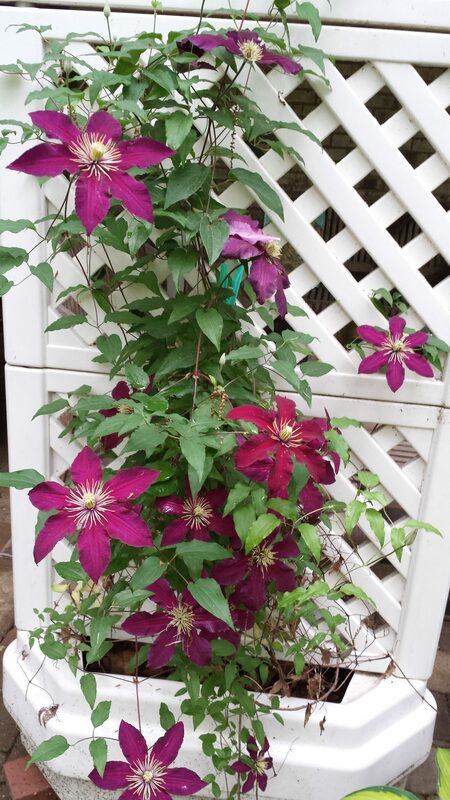 This clematis vine went gangbusters this year! 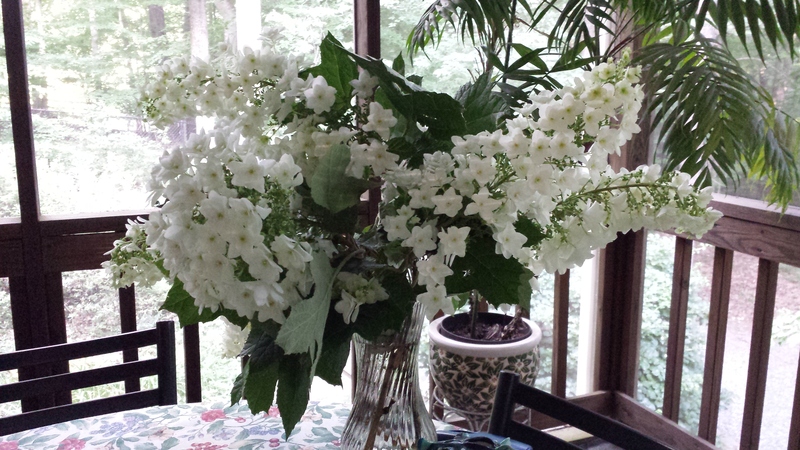 Some of my favorite blooms this year are still my oakleaf hydrangeas. 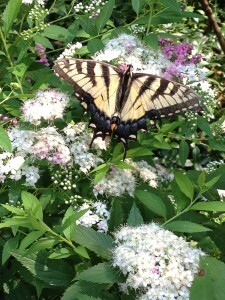 And of course, what’s a garden without some critters? 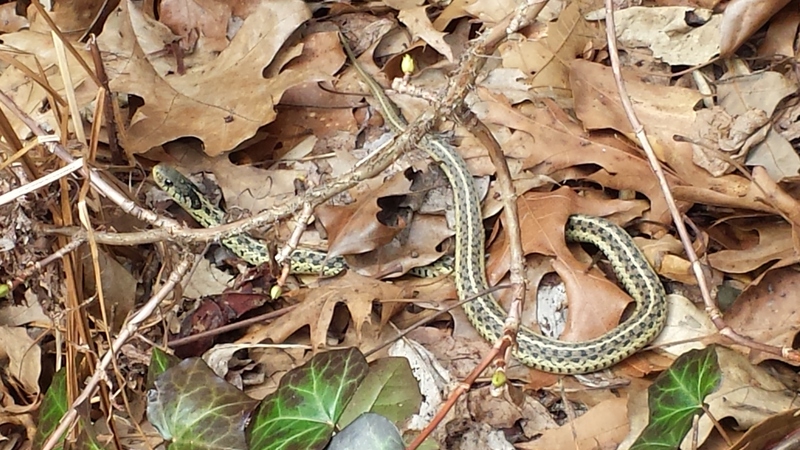 I found a cute garter snake that watched me from afar and continues to pop up where I’m not looking. 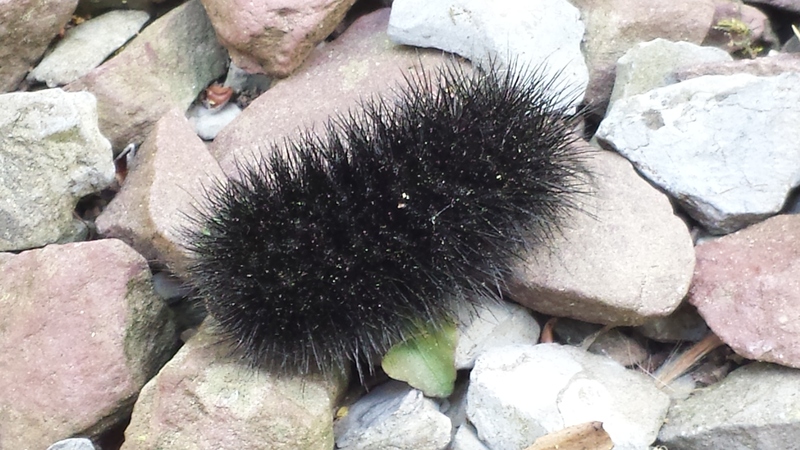 And what happens when you find a totally BLACK woolly bear? What does THAT mean?? So what happens when you find a solid BLACK woolly bear? 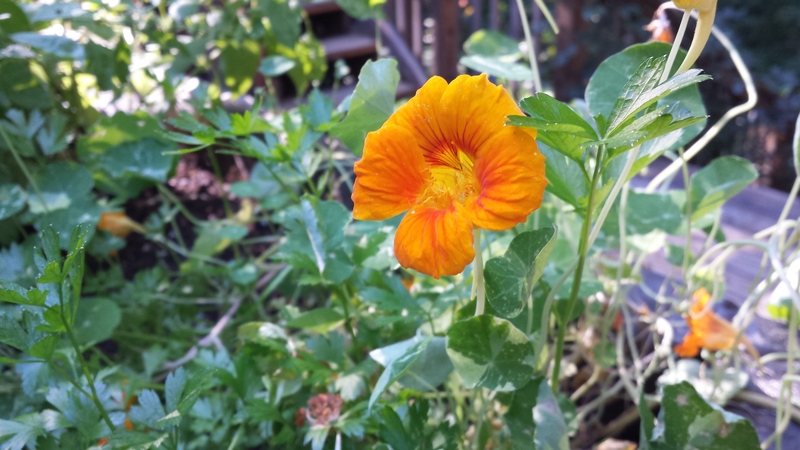 What’s happening in YOUR garden? Please leave a comment and let us know.